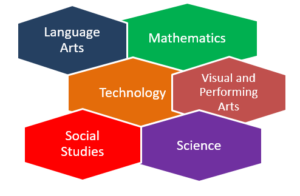 IGCSE Board Cambrdige Curriculum at KC High is broad-based, spiral and holistic, encompassing a wide range of subjects spread over six groups, across all grade levels. Content, objectives of the lessons and teaching methodologies are designed to make the curriculum inter-disciplinary and relevant to the learners. The curricular framework given by CIE for English, Math, Science and ICT is used as the basis for building the curriculum for these subject areas from Year 1 to Year 8. For other subject areas such as Social Sciences and Second Languages, teachers build the framework, revise and refine it to dovetail seamlessly with the syllabuses prescribed by CIE at IGCSE level for these subject areas. The curriculum has been spiraled down all the way to the Pre-primary program, in order to make the learners ready and capable of handling the rigors of the program, as well as facilitate a natural progression in learning. In Pre-primary and Primary School, children work with hands-on materials and equipment, and lessons are designed to make Math enjoyable and relevant to them in their daily lives. Online resources and self-assessments enable students to continue their Math learning at home at their own pace. Linking Math to other subject areas across all grade levels makes it at once enjoyable, relevant and practically applicable in their academic lives. Scientific skills, attitudes and understanding are built through the content areas of Physics, Chemistry, Life Sciences. Enquiry skills underpin the whole course year on year, constructing the skills of designing and conducting experiments, observation, hypothesizing, gathering evidence, recording data, analyzing data, evaluating and drawing conclusions. English: English is the medium of education and is also taken as the First Language. Learners learn to respond to information and literary texts with understanding and enjoyment, critically analyse texts, and communicate confidently in a range of settings, both formal and informal. Reading and Writing skills include poetry, fiction, drama, and non-fiction texts. Students learn to develop skills of writing stories of various genres like fables, folk tales, historical fiction, fantasies, mysteries, adventure, etc. ; poems of various kinds on a variety of themes; non-fiction genres such as journal entries, newspaper reports, scientific articles, brochures, pamphlets, advertisements, biographies, etc. Reading Program: The Reading Program at KC is both exciting and comprehensive, beginning right from Kindergarten, with early exposure to fiction and non-fiction texts. Students are encouraged to read a wide genre of books both at school and home. Apart from graded reading programs, the pupils in Pre-primary and Early Primary years are exposed to a broad range of books both from their class libraries and school library. Every term, the school prescribes some “term books”, which the students explore throughout the term with their teachers. Work on the term book is inter-woven with skills of writing, vocabulary and grammar that are prescribed during the course of that term. Apart from books written by popular Indian and Western children’s authors, right from Later Primary years, students are exposed to global classics of all-time great authors including Charles Dickens, Mark Twain and Shakespeare. Both as prescribed reading, and books that students can pick up from the library, they are exposed to a wide range of genres including Fiction such as Fables, Folk tales, Science Fiction, Adventures and Mysteries, Historical fiction, etc., and Non-fiction such as Reports, Biographies, Autobiographies, Journals and Encyclopaedias. Complexity and depth of the texts increases over the years, focusing on building felicity on par with First Language learners globally. Over the years, students show their comprehension and appreciation via a plethora of skills such as summarizing, inferring, comparing, contrasting, predicting, identifying author’s purpose, identifying main idea and details, reading logs, analyzing writing style and engaging in reader’s theatre. Most of our students are bilingual and culturally we believe that, in India, we have great adeptness with learning multiple languages. Research has proven that bilingualism has many cognitive advantages. Bilingual children are better in cognitive processes such as problem solving and attentional control. Therefore, we encourage early exposure to a Second Language at school. In Kindergarten all students are exposed to listening and speaking skills in both Tamil and Hindi. Beginning Year 2 (Grade1), students choose one language from Tamil, Hindi or Spanish. Apart from continuing to focus on listening and speaking skills right through Primary and Secondary years, a range of reading and writing skills are also developed right from Year 2 by following a systematic, progressive approach to make learning a language an enjoyable and culturally enriching life experience. Reading program in Second Languages include exposure to a wide range of texts both as in class and online resources. Writing kills, as in the First Language program, also aims at developing thoroughness in writing various genres. The Social Studies curriculum is built in-house for Primary and Lower Secondary grade levels to make it most meaningful to our diverse learners. Teachers build the framework, revise and refine it to dovetail seamlessly with the syllabuses prescribed by CIE at IGCSE level for these subject areas. It straddles the cultural, social, historical, and geographical aspects of Chennai, India and the world. It aims to develop understanding and appreciation of their local and national heritage and culture, and also that of other cultures around the world. Broad content areas include Geographical Regions of India and the world, Past and Present Human Achievements, Civilizations, and Political Systems. There is a strong emphasis on enquiry, research and presentation skills, which underpin all content areas every year. At KC High we firmly believe in fostering holistic development by enabling students to explore ideas, experiences and feelings and expressing them through Visual art and Performing arts of Music, Movement and Drama. Beginning with early exposure to Art and Craft in the Pre-primary section, with simple use of colours, shapes, textures, lines, the Art curriculum at KC moves quickly onto developing serious appreciation and critical analyses of various styles and forms of art, along with the work of various acclaimed global artists, in the Primary and Secondary School years. A well-defined Art curriculum from the Primary section exposes students to drawing, painting, and sculpture and allows them to explore their emotions and imagination through various media and materials and push their frontiers of creativity. We have a dedicated art room and a well -qualified art teacher to guide the students, through the years. Music, Dance and Drama curricula are developed and delivered by specialists in the respective fields. The Music program for Primary and Secondary School at KC High has been designed in-house. It encompasses both Indian and global music, developing an appreciation for various musical forms and genres, rhythm, and works of various artists. Drama is given a lot of importance at KC High since it facilitates self-awareness, exploration and expression of one’s feelings, understanding of people and the world. We believe that it develops individual confidence and team spirit, making students more comfortable with and accepting of, one another. While reading and writing play scripts and performing in plays forms an integral part of learning in many subject areas, in Primary school, the formal Drama program, designed and delivered by reputed Theatre artist V.Balakrishnan, begins in late Primary school years and progresses over the Secondary school years. Movement education in the form of various dance forms, beginning with basic exercises and spanning complex movements to rhythm and music, is developed and delivered by experts in the field, Mr. Manikandan and MS. Prarthana, who run a dance school in the city. Through Movement Education at KC High, children learn to be more comfortable with themselves and their bodies, grow in confidence and self-esteem. Apart from the six subject groups, a lot of emphasis is given to Physical Education in the curriculum. Students play outdoors every day and get some form of training in Physical Education almost every day. Beginning with exercises that aim at improving gross motor and fine motor skills, at the Pre-primary level, the program progresses to physical fitness exercises, athletics and gymnastics at the Primary grades. At various age levels students participate in Yoga, Compulsory Sports and Games including Basketball, Cricket and Soccer. Formal training in these specialized sports is by professional coaches who also train them to participate in various Inter School Sport competitions. For the current generation of digital natives we provide formal and informal access to technology both as a discipline by itself, and also making it accessible and pertinent to all subject areas. ICT as a subject is offered right from Year 2 (Grade 1). All learners have access to the Computer Lab. All classrooms are technology enabled. In Primary and Secondary school learners develop key ICT skills of word processing, spreadsheets, presentations, email, internet usage and safety, making videos/animations and databases. Join us at KC High by applying for teacher jobs or an administrative role and be a part of an energetic, vibrant and dynamic team! Read about various interesting education-related topics that our on our Head of School Mick Purcell's mind.